Weird things appear to be happening with global fauna. In the past few days reports have surfaced of massive bird deaths in Arkansas and Louisiana, 20 miles of dead drum fish in an Arkansas river; as well as confirmed reports that Meg Ryan and John Mellencamp are dating. But now, somehow things have impossibly gotten weirder: Brazillian site Paraná-Online reports up to 15 tons of dead fish washing ashore in South America. Fishermen have found at least 100 tonnes, mainly sardines. 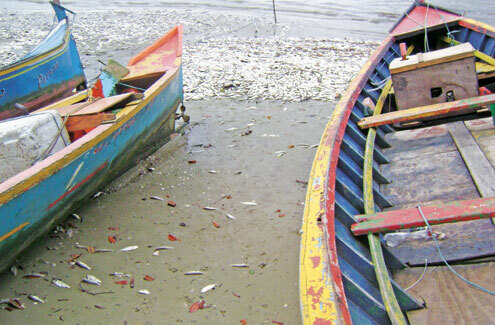 A survey conducted by the Federation of Fishermen’s Colony of Paraná, Paranaguá on the coast of the state, indicates that at least 100 tons of fish (sardine, croaker and catfish) have turned up dead since last Thursday off the coast of Parana. On Sunday, representatives from the Environmental Institute of Paraná (IAP), the Secretary of State for the Environment and Water Resources (SEMA), took samples to verify the reason for the deaths. O relatório será divulgado hoje. The report will be released today. The president of the Federation of Fishermen’s Colony of Parana, Edmir Manoel Ferreira, reports that between Paranaguá and Guaraqueçaba at least 2,800 fishermen depend on the daily seafood. Only one community came to bury 15 tons. We are experiencing a very sad situation on the coast, “reports. Previous posts on this topic started with the joking headline “End of Days” which is a media narrative picked up by some erstwhile news outlets. If these reports turn out to be true, expect that meme to grow leaps and bounds.